In our state, plastic bags are slowly being outlawed. Reusable grocery bags are the solution that our state sees to help solve the environmental problem that is plastic bags. 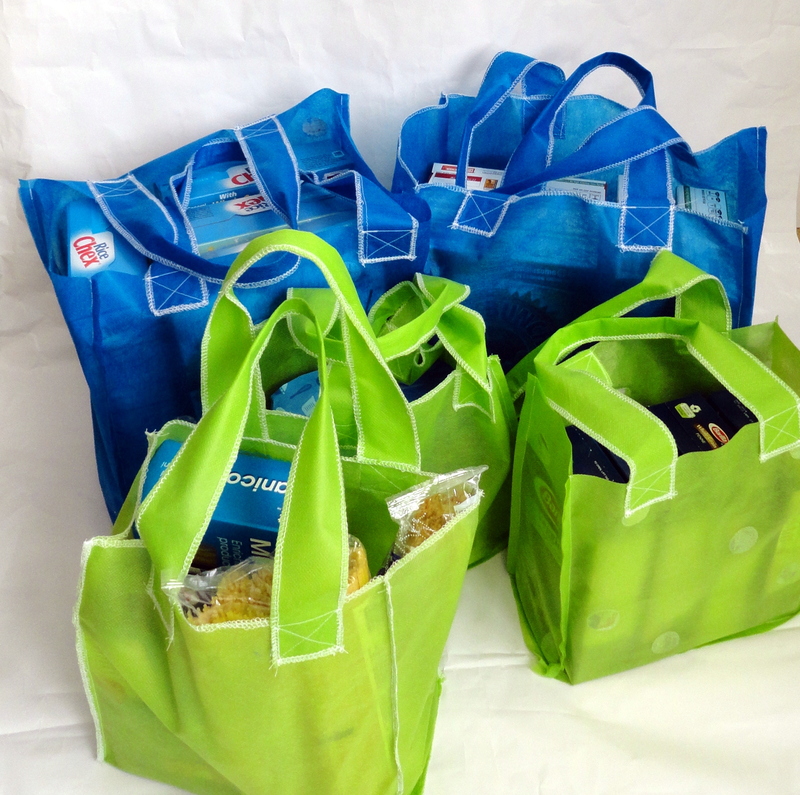 As a family of five, we can never have enough reusable grocery bags for the grocery store. 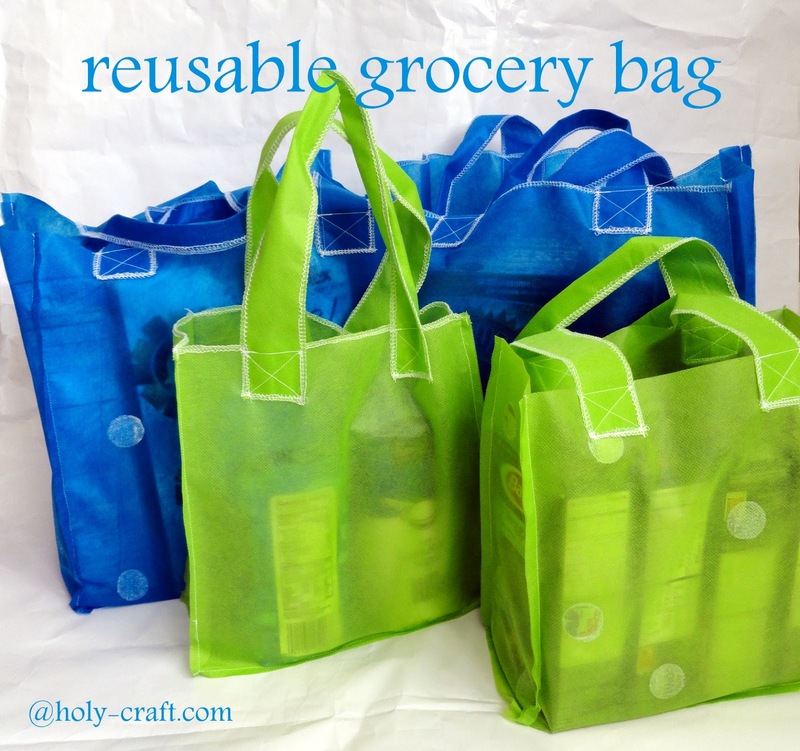 Today, I'm going to show you how you can make your own reusable grocery bags for your next grocery trip. 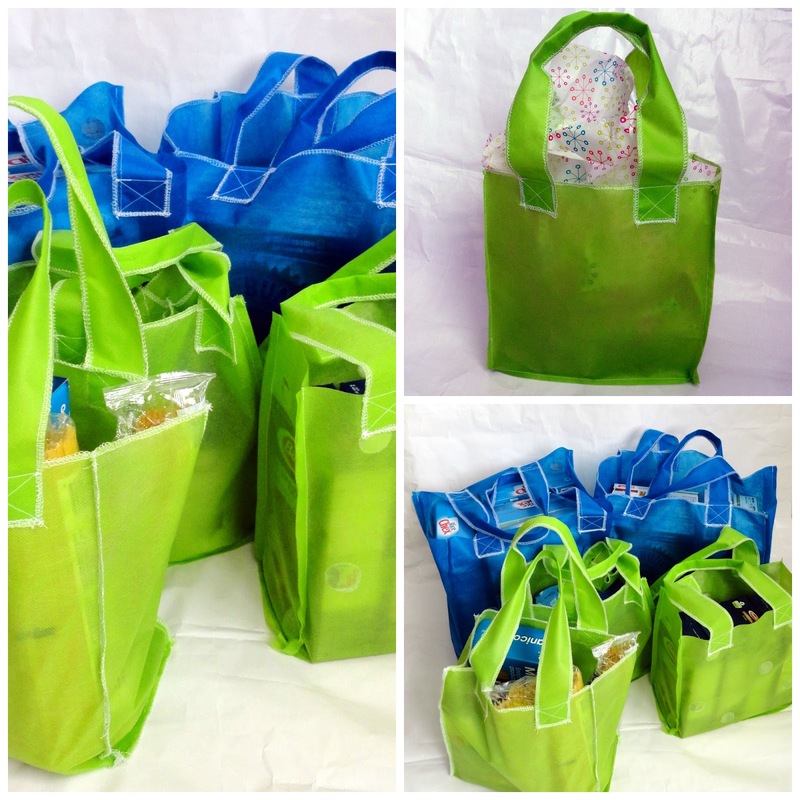 Or, if you have enough reusable bags already, you can never have enough gift sacks in your gift closet. This bag has many uses! 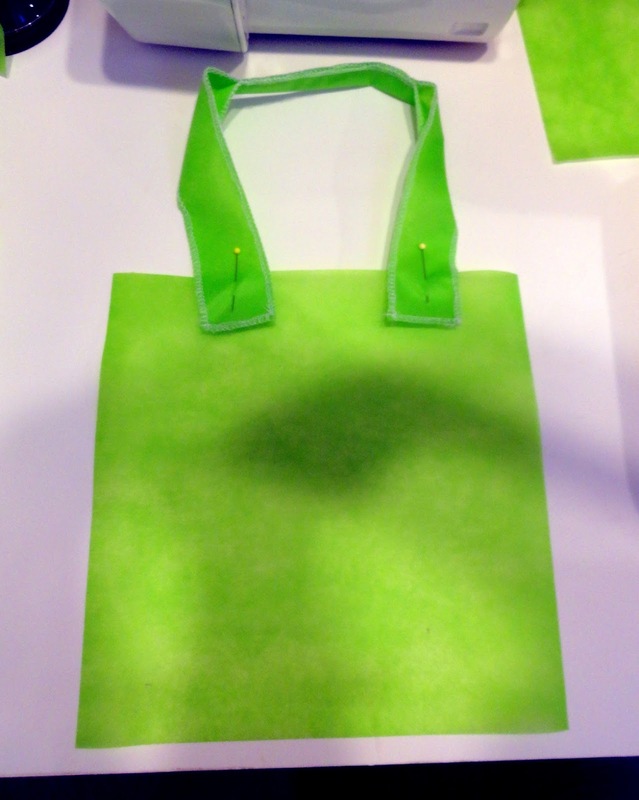 Smart fab is a smart alternative to paper and cloth. 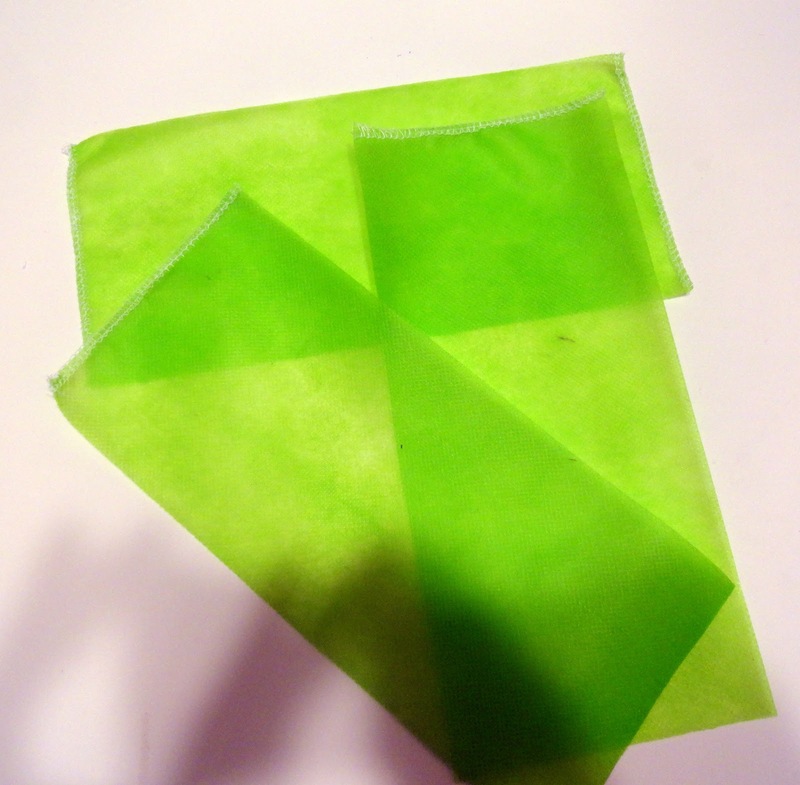 It's a non woven fabric that you can easily cut, fold, glue, sew and staple. Best part, it doesn't fray and it's recyclable! There are many uses for smart fab. 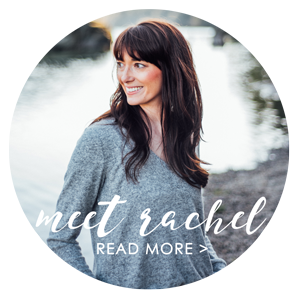 You can check out this site for more uses. 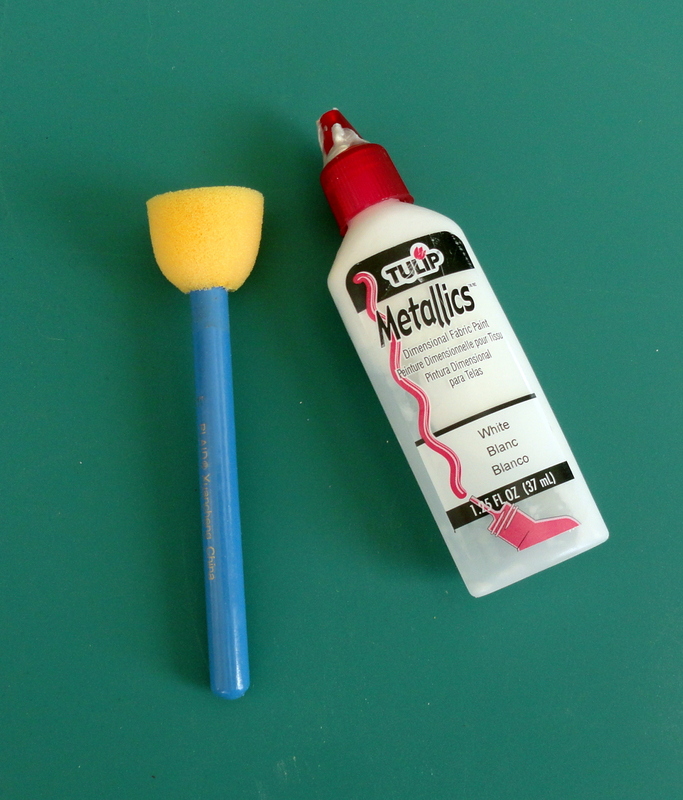 you can always use any cotton fabric that you have on hand too. I made two bag sizes. This tutorial will be for the smaller bag. Just substitute any measurements if you are making the larger bag. Because you want the straps to be strong, you will be cutting four straps and will be doubling the straps to increase their strength. Place two straps on top of each other and serge them together. 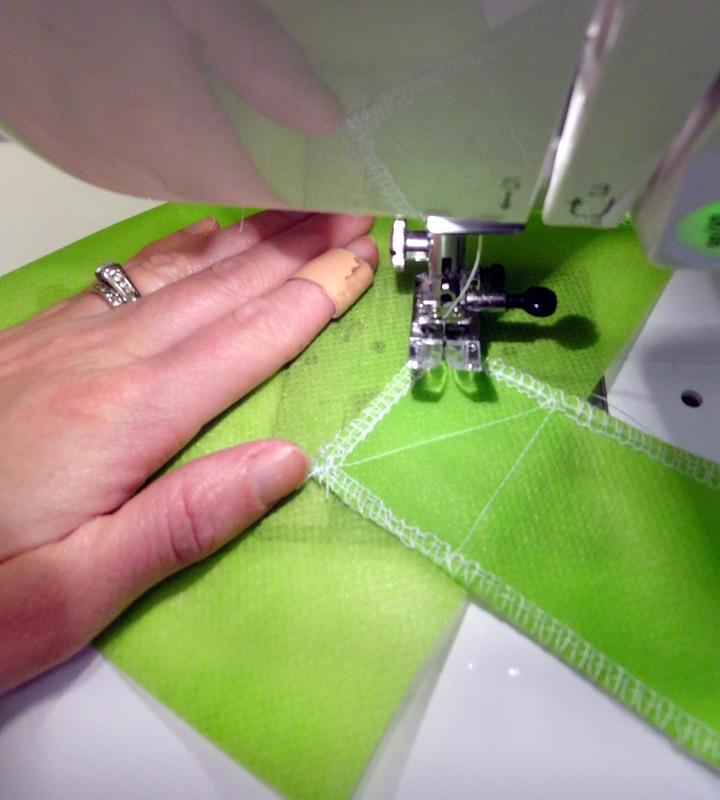 If you do not have a serger, you can use a zig zag stitch. 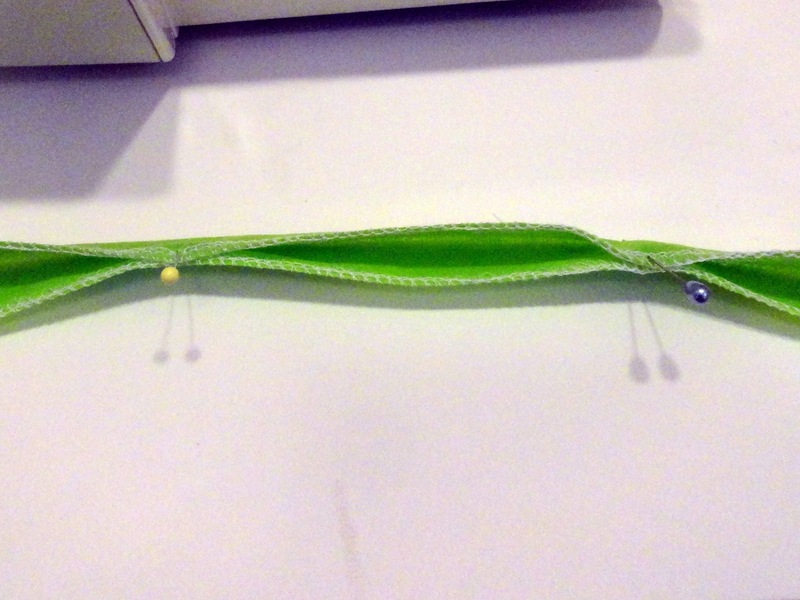 To reinforce the straps even more, pin 5-6 inches in the center of your strap and sew them together at the opening. 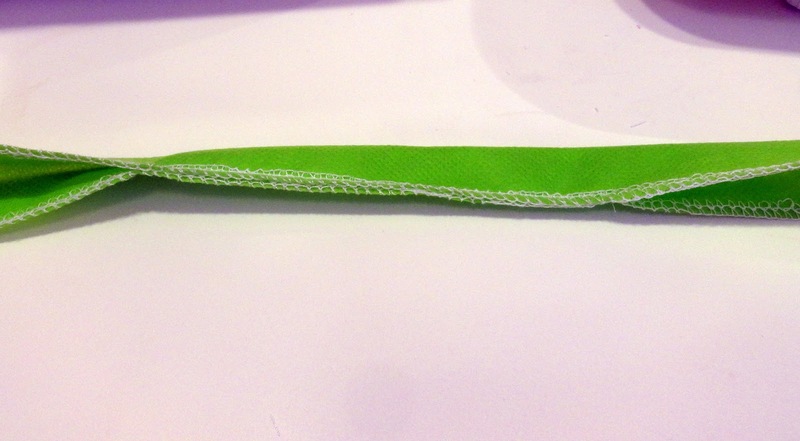 Your straps will end up looking like this in the center. I wanted to add polka dots to the plain fabric before I sewed them together. I used a pouncer and dimensional fabric paint. 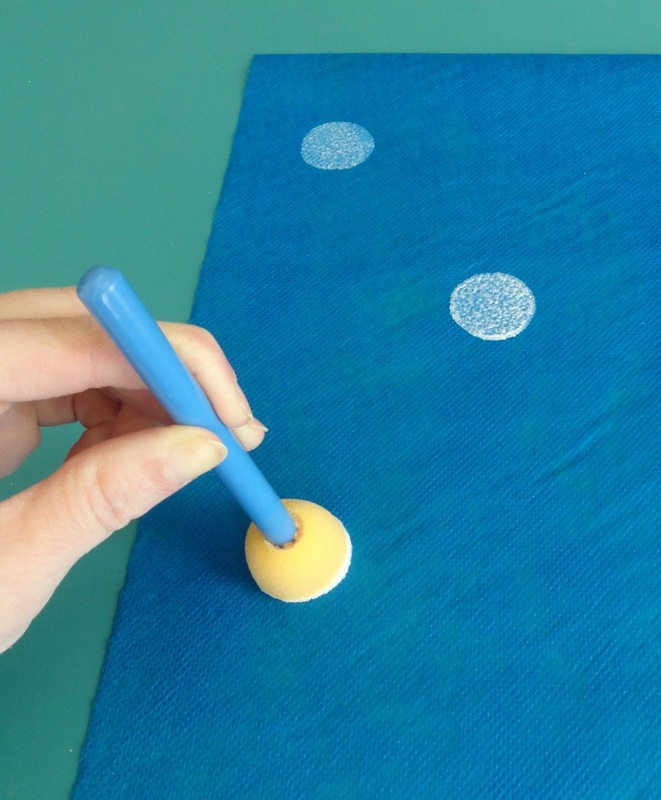 Dip your pouncer in your paint and carefully press them down on your fabric. 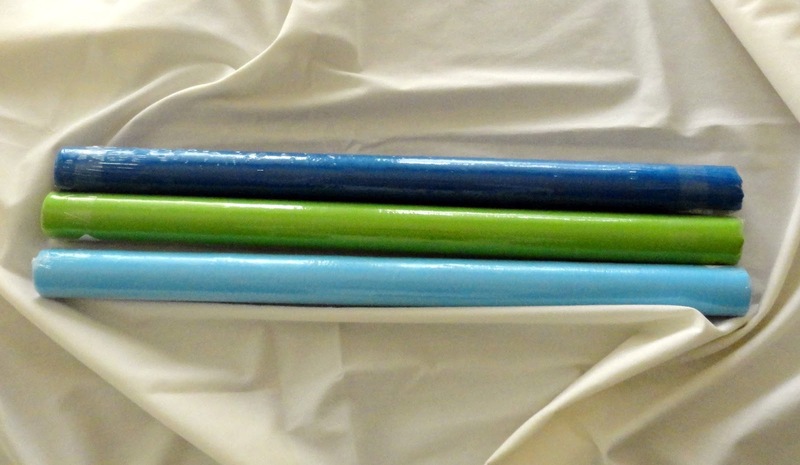 You really only need to paint your side, bottom and front and back pieces. 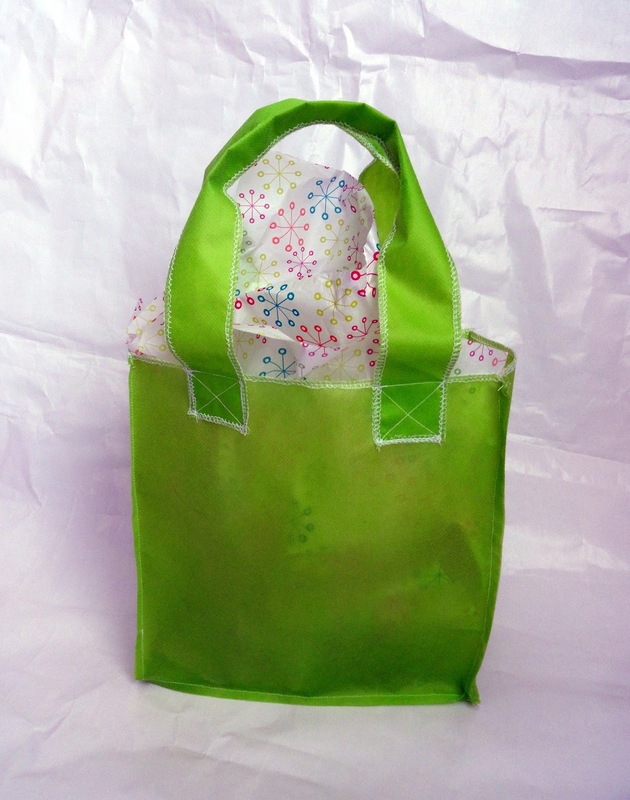 While you wait for those to dry, you can sew your plain bags together. 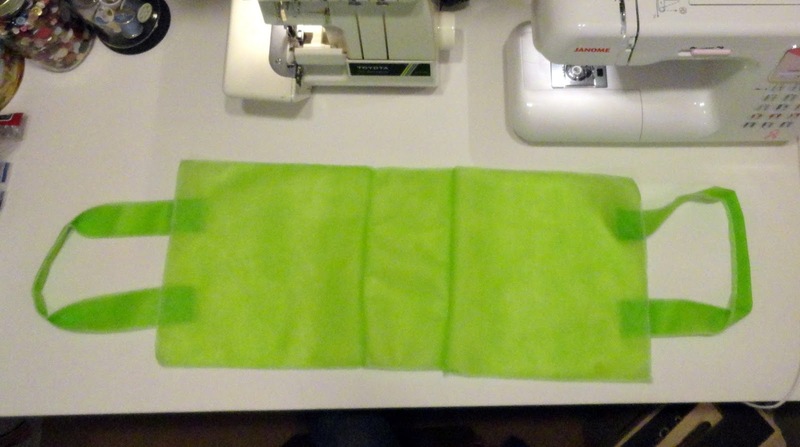 Take your sewn straps and pin one on each side of your large bag piece. I eyeballed it, but if you are picky, you can use your ruler to measure how far apart your straps are. I sewed the straps down on the bag in an "x" pattern. This helps to strengthen your straps. At this point, you should have two pieces with your straps sewn down on top. I like to serge the edges of the sides and bottom. 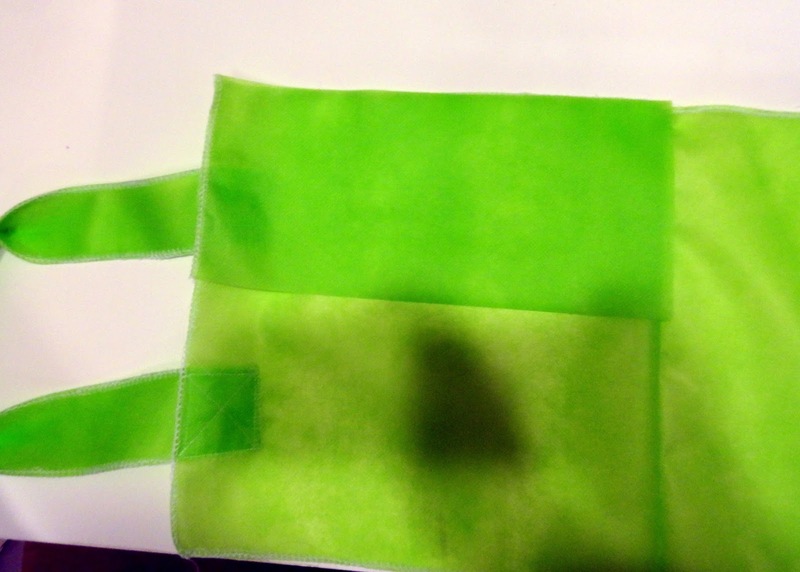 Again, you can zig zag stitch or leave it alone since this material doesn't fray. 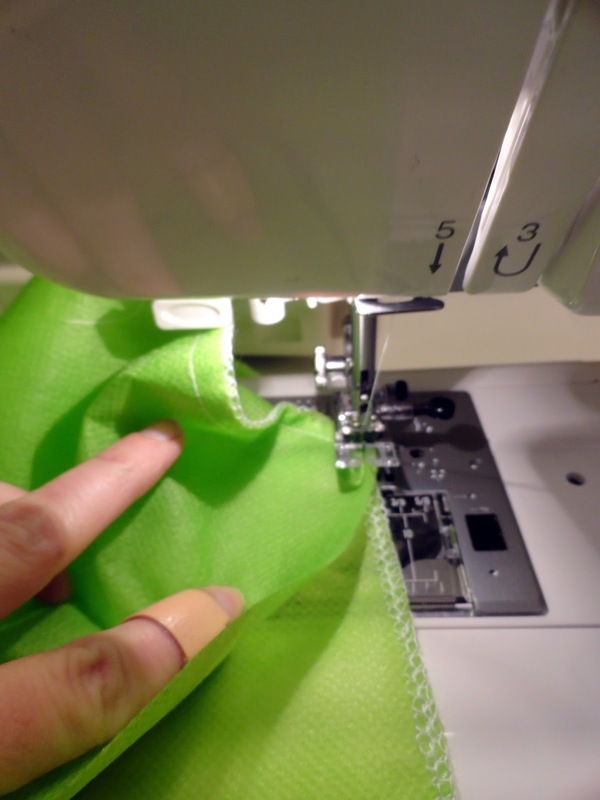 Take your bottom piece and sew at the bottom of your two large pieces. I like the seam on the outside so I stitch them wrong sides together if you can even distinguish which side the wrong side is! The next part is a little trickier. 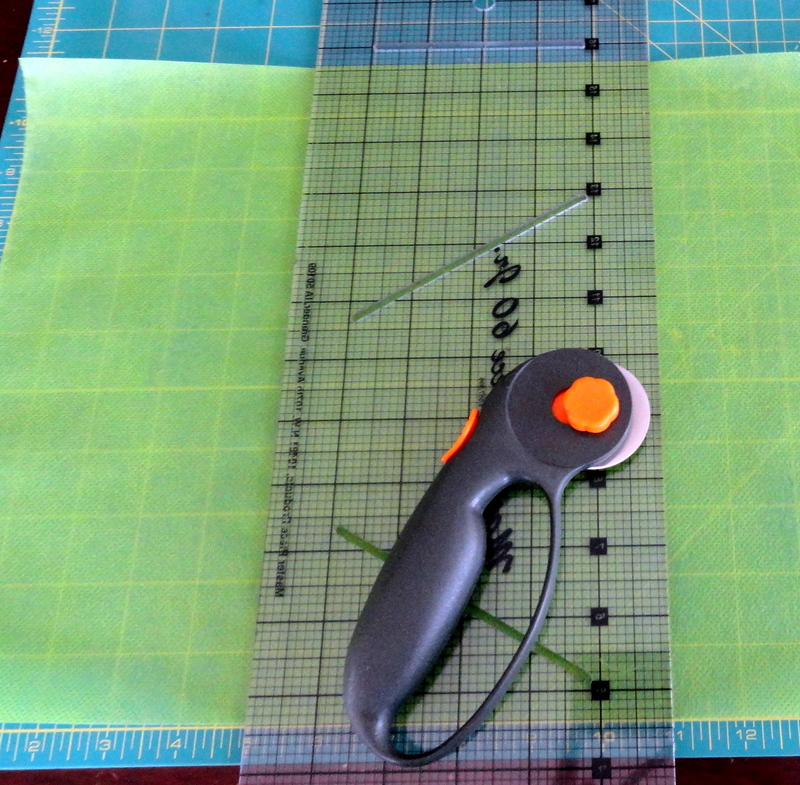 You will take one of your side pieces and starting at the top by the handle, start sewing down to the base. 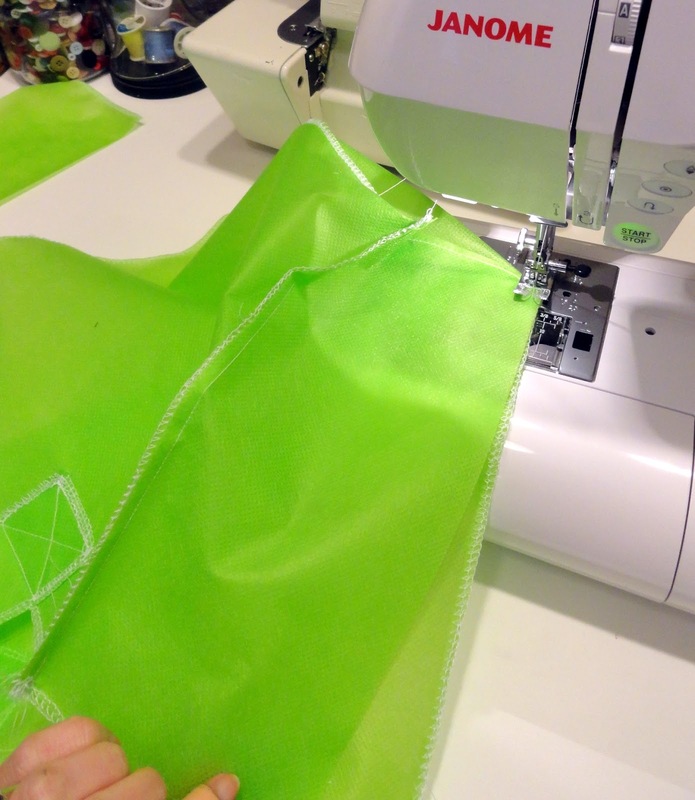 Once you get to the base at the bottom, you will stop your needle, turn your fabric and sew the bottom shorter end of your side piece onto the base of your bag. 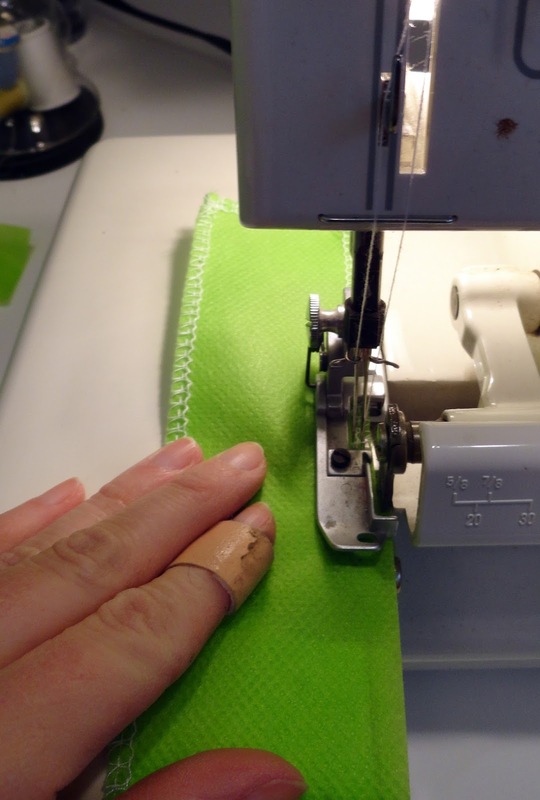 Once you sew the bottom and the side together, stop, turn your needle and your fabric again and sew up the other side from the bottom to the top. Repeat this with the other side and you have your bag completed! You can hold a lot of groceries in those bags! Or, you can use your bag as a gift bag. I've got a lot of new reusable grocery sacks to use next time I head to the store. That is, if I don't forget to bring them along! 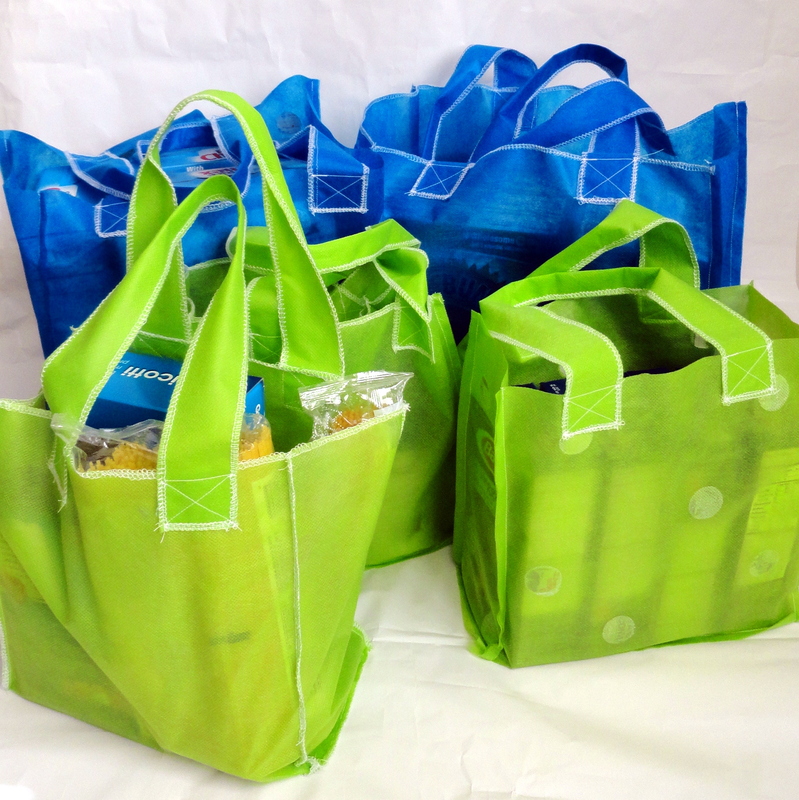 How do you remember your reusable bags when you go to the grocery store? I need a tip or two. I just leave them in my trunk so they are there when I need them. 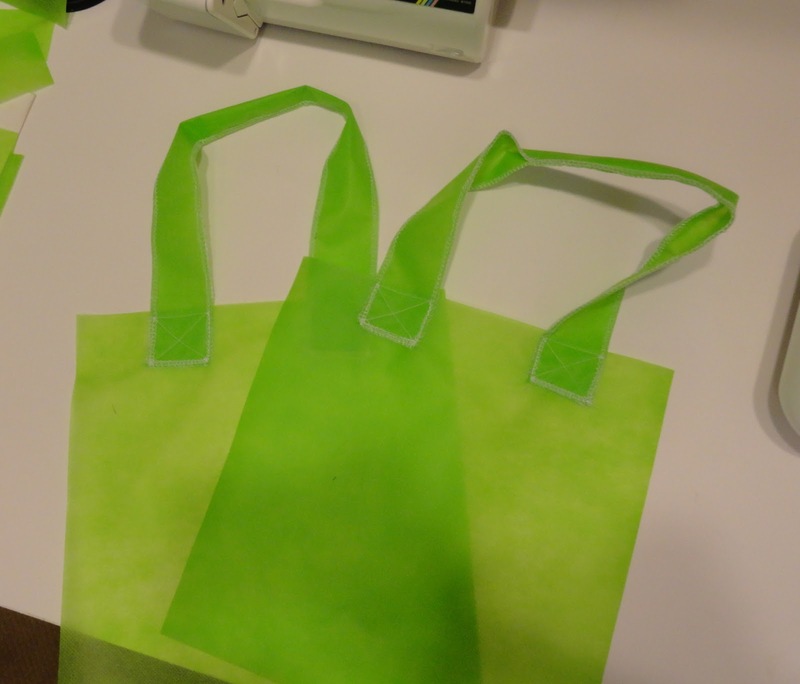 Those are some great reusable bags! I will have to add them to my swing to-do list. I keep my bags in my car, there are ones for groceries and ones for fabric (my LQS does a monthly drawing for a $20 credit if you use your own bags). When I bring them in after grocery shopping I either put them back in the car as soon as the groceries come out or I hang them on the door knob so I put them in the next time I go to the car. As soon as I unload the groceries, I put them back in the garage, right in front of my car. That way they don't clutter my car (or move somewhere I can't see them) and I grab them when I head out to the store next. What I need to do is keep a bag with me for the little purchases at various places. Put "take bags" on your grocery list. Every week! I always review my list before I leave to go shopping. I add errends, things to take along, other reminders to my shopping list. I try to get a lot done in one trip,since I live quite a way from the towns where I shop. We put ours back in the car as soon as the groceries are put away. I love the idea of making these as gift bags too!! 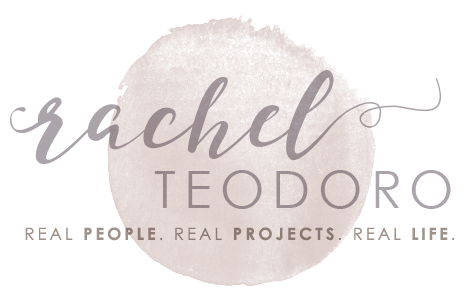 Wanted to let you know I'm featuring you when my link party opens up tonight.